With Cotton futures nearly 75% off their 2011 highs, market participants may be looking for a reason to get long this market. The weight of evidence however, suggests there is likely another 15% downside ahead. The daily chart spanning back nine years shows prices topping and subsequently beginning a downtrend in early 2011. Over the past eighteen months prices have consolidated as they attempted to break back above the 2012 lows and downtrend line from the 2011 highs. Despite its efforts, Cotton could not close back above the confluence of resistance at 68 and is now threatening to break through the lower end of the 57-68 range. Over the past year we’ve been watching Cotton build a very impressive base that could create a major bottom. The old saying is, “The bigger the base, the higher in space”. The reason for this is that the longer it takes for supply and demand to work together to reverse a trend, the more powerful the ensuing trend becomes. From huge bases we see longer than average trends created. 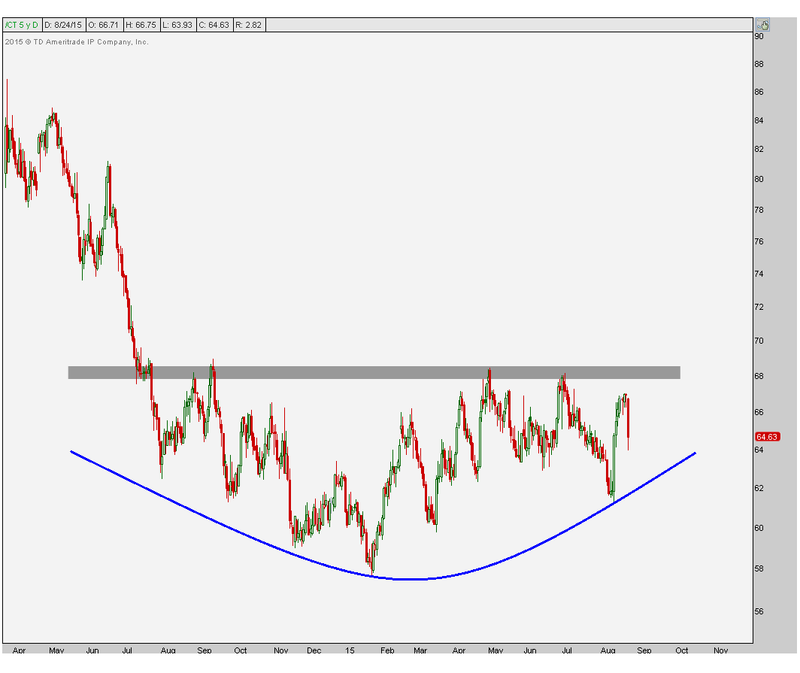 A great example of this recently is in $USDCAD – look at the size of this base, and then look what happened. The best example of this I can find today is in Cotton. The interesting thing here is that this area around $68 is even more important if you take a step back and look back a little bit further. Here is a weekly chart of Cotton where we can see that this overhead supply from over the past year was former support back in early 2010 and again in the summer of 2012. Potentially, this can be an epic failed breakdown. From failed moves, tend to come really fast moves in the opposite direction. In this case, higher. Also notice how clean the downtrend line is from the 2011 highs. We’re right there. A simultaneous breakout above this overhead supply and downtrend line from 2011 should be the catalyst for a major move higher. We want to be aggressive buyers above and only above those levels. 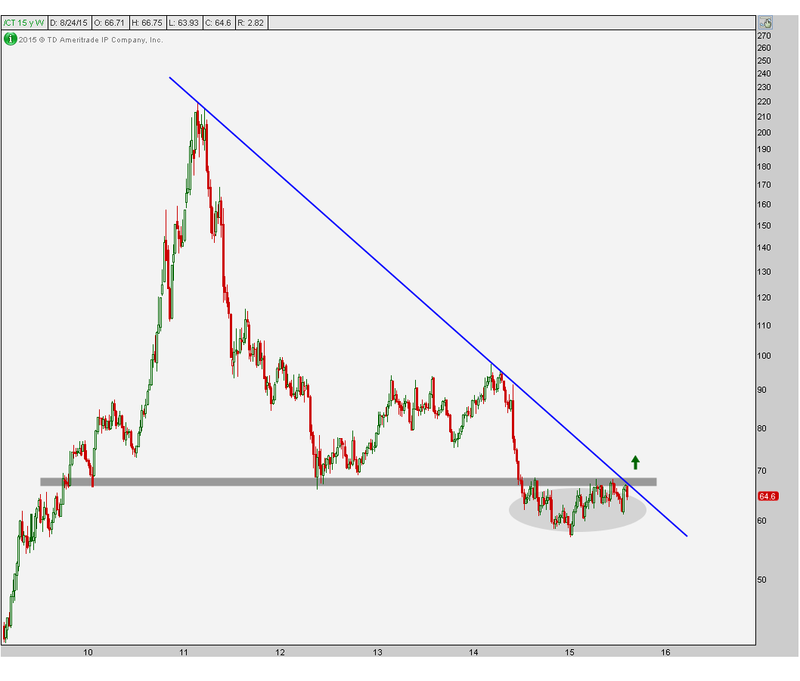 Click Here to receive weekly updates on these charts as well as the same multi-timeframe analysis for 16 more commodities futures contracts and major currency crosses.